The commercial paper industry's plans to plant forests of genetically altered eucalyptus trees in seven Southern states has generated more cries from critics worried that such a large introduction of a bioengineered nonnative plant could throw natural ecosystems out of whack. Australian eucalyptus trees grow faster than native hardwoods and produce high-quality pulp perfect for paper production, but thus far, they have been able to thrive only in very warm climates. South Carolina-based ArborGen genetically altered the trees to withstand freezing temperatures, and the idea with the test forests is to see how far north they can now be grown. The test sites will cover a total of about 300 acres in Florida, South Carolina, Texas, Alabama, Mississippi, Georgia and Louisiana. While genetically engineered crops such as corn and soybeans have become common, ArborGen's experiment marks the first large planting of designer trees in the United States. The company says plantations of hearty, faster-growing eucalyptus could produce more timber in a smaller area and allow conservation of natural forests. But critics say that despite the USDA's assurance that the trees pose no environmental threat, not enough is known about their effect on natural surroundings. "We have many reservations about it," said Neil J. Carman, a biologist who serves on the Sierra Club's genetic engineering committee. "We don't think the scientific evidence is in yet that says this is a good idea." Anne Petermann, executive director of the activist group Global Justice Ecology Project, said eucalyptus trees are invasive, require vast amounts of water that could reduce groundwater levels, and increase the wildfire risk because they are so flammable. "This is quite a dangerous tree to be mass planting," Petermann said. But ArborGen CEO Barbara Wells said eucalyptus trees have not proven invasive in dozens of tropical countries where they are widely grown on plantations. Also, ArborGen genetically modified the trees to limit their ability to disperse seed and spread. Although the new field trials will significantly increase the number of genetically engineered trees being grown, Wells called it "very confined research." "The total is 300 acres, but when you're doing tree research, that really is very small acreage," she said, noting that about 20,000 acres of genetically unaltered eucalyptus trees are already grown in central and southern Florida for production of wood chips and mulch. The new test forests will show whether the genetically altered trees can thrive farther north in Florida, where freezing temperatures can occur in the winter. Donald Rockwood, a professor emeritus in the University of Florida's School of Forest Resources and Conservation, has worked for about 30 years on developing eucalyptus trees that thrive in Florida. He uses traditional breeding techniques, not genetic modification. 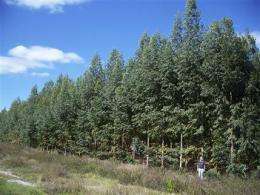 The genetically unaltered trees growing in controlled plantations in Florida have not proven invasive, are relatively efficient users of water and are no more flammable than other hardwoods, said Rockwood, who was hired by ArborGen to do a report on eucalyptus trees' invasiveness because of his experience working with them at the university. Still, Rockwood said, introduction of any genetically altered species poses risks. For example, the gene that makes the trees resistant to cold could be transferred to surrounding plants, allowing them to spread farther north than nature intended. "It certainly needs to be done carefully, it needs to be regulated and there needs to be a period of well-defined observations," Rockwood said. The ArborGen trees will be planted in seven counties throughout Florida, four counties each in South Carolina and Texas, two each in Alabama and Mississippi and single counties in Georgia and Louisiana. Rockwood said they can grow about 25 feet per year and be ready to harvest in less than three years. ArborGen is a joint venture of International Paper, MeadWestvaco and Rubicon Ltd.
Eucalyptus evolved in a dry tropical climate and it promotes intense fire to propagate itself. It competes with trees in seasonally dry climates where trees have adapted to withstand rapid but not intense fire. Being very thirsty it is also purposefully planted to lower the water table as a mosquito control. Making Eucalyptus more cold resistant, will enable the tree to act competitively outside its natural range with unforeseen effects. Releasing untested modified or alien plants is like opening 'Pandoras box'. For example I see Japanese Knotweed along roadsides from one end of the UK to the other, DEFRA (UK gov. agency) puts the cost of Japanese Knotweed eradication at 1.5bn, but how many knowledgeable individuals does it take to monitor a country, and how would it be different with this Eucalyptus? How will it be done carefully? Really? Since when can genes migrate from one genus to another genus? I'd love to know how this works because it would revolutionize traditional breeding. If I could plant a red Zinnia next to a white Rose and have the gene for red color "jump" into the Rose, what a boon! If Japanese Knotweed is growing along roadsides from one end of the UK to another, doesn't that indicate that it colonizes disturbed areas? A roadside is not a natural, pristine habitat, but a depauperate mixture of assorted colonizing species trying to establish some sort of biome after the road construction destroyed all the native plants. Sorry, this is not "invasion". I happen to live smack dab in the middle of the South Carolina paper belt. There's hardly any native trees left in this part of the state. Just about anywhere you can plant a pine tree, there are neat rows of them planted as far as you can see. These are not native trees. They consume tons of water, grow fast, and drop a prodigeous amount of extremely flamable needles so thick that nothing else can grow around these trees. You should see the clouds of yellow/green pollen every spring when they germinate. The eucalyptus can't be any worse, and if it means more money in this very poor part of the country, then it would be welcome. The native plants and animals have been gone for decades. You aren't going to hurt them with these trees. The only things that do well around the pines they plant now are poisonous snakes. If you end up destroying their habitat, then please plant more eucalyptus. Well I guess since Monasanto already contaminated the food supply may as well ruin our native Trees as well. Why can't we just grow hemp and use it for paper\oil\rope like we used to?